The West Riding Omnibus Museum Trust -- 25 buses available to see - restored to their former glory by a group of dedicated volunteer enthusiasts. A great sign that West Yorkshire is keeping their bus heritage alive. Events and rallies held regularly. 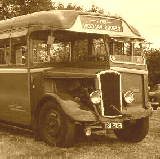 Dewsbury Bus Museum is a small band of dedicated volunteers whose aim is to preserve the transport heritage of the West Riding and the surrounding areas. Fourteen of the buses are stored in a small building in Ravensthorpe, near Dewsbury and others are stored elsewhere. Some of the buses are owned by the groups, others by individual members. The museum is a registered charity and virtually all of ther income is derived from members' subscriptions, the proceeds of events and book sales and rental of space to members to store their own vehicles. Open strictly by appointment. Please telephone.